India is a very religious country. Almost everybody is involved in worship in some way or other. From cars, restaurants, shops, in shrines: every where you see religious pictures and objects. Many years ago, a group of people visited India. They had to cross a wide river. That river was called the Sindu. But these visitors could not say the word Sindu properly. So they called the people who lived there Hindus. That is how the Hindus got their name. Their religion is called Hinduism. It is the biggest religion in India, and the 3rd largest in the world. There are many different gods in Hinduism (always spelt by Hindus with a small g). Nobody in the world can list them all. Many villages have their own ‘god’, and every god has a statue to go with it. Like in Greek Mythology, gods are found in many stories in the Hindu Vedas and other holy books. They can be male or female, or even take the form of animals. Sometimes they might even behave badly! Some of the most famous gods in Hinduism are Brahman (creator), Vishnu (the master), Shiva (destroyer), Krishna (the hero). People like to read the stories of these gods, or see them in street-plays. Indian broadcasters even made a very popular TV series based on the gods’ adventures! As in Christianity, priests can also be found in Hinduism. These priests serve in Hindu temples and shrines. Hindus believe that one of the ways to be blessed by god is to bring gifts to the temple. This is called sacrifice or ‘puja’. Flowers, rice or incense are brought to the temple and put down before the idol. The Hindu priest then puts a sign in coloured powder on the forehead of the worshipper. This sign (or tilak) signifies a blessing. Karma simply means: whatever you do will have results. Karma is the law of sowing and reaping. Some people call it ‘cause’ and ‘effect’. Example: If you work hard, you will get smart. If you do bad, you will get punished. Hindus believe that sometimes ‘bad’ karma could be stopped if we pray or offer sacrifice in the Hindu shrine. Hindus believe in the cycle of life. They believe that we are born and reborn many times over. Maybe a person is first a butterfly. When the butterfly dies it is reborn as a cat. When the cat dies it may be reborn as an eagle. And so on until the person is reborn as a human. According to reincarnation, people only take their character to a new life. In every ‘life’ they learn a little more and climb a little higher. This cycle ends when finally they find god. At that point they stay in heaven. In India, the holiest animal is…the cow! Cows roam freely on the road, and they get lots of free snacks. Often you will see people touch the forehead of a wandering cow on the road. They believe it brings a blessing to touch the holy animal. You may be wondering: Why a cow? Many years ago, most people in India were farmers or fishermen. The cow was very important to farmers. The cow’s job was to pull the plough, and give milk. And the Indian people looked at the cow and said: The cow is the biggest servant of all! It must be a blessed and holy animal. Hindus believe that all life is holy and precious. Everything was made by God, so everything has a little bit of God inside. Many Hindus still like their chicken breast or mutton chops. But you will never see a Hindu eating beef: the meat of a cow. Eating beef became prohibited in 2015 in parts of India. Many forms of meditation are practiced in India. The most famous is Yoga. Yoga means ‘bonding with god’. Hindus believe one can reach god through meditation. When people practice yoga they sit very still on the floor; often cross-legged. During the exercise, they are silent. Sometimes these exercises last for hours. The Hindu scriptures speak about yoga in many ancient texts. Yoga is taught in almost every country in the world. A teacher of yoga is called a yogi. Another well known form of Indian meditation is Transcendental Meditation, or TM. The Vedas is the main holy book for Hindus. It’s enormously long and it’s oldest texts date from 1500 BC. It is a collection of hymns of praise to the gods. The Puranas, a collection of stories about the lives of saints. People in India love to celebrate! They look forward to their festivals for months! And India has more public holidays than any other country on earth. At festival time, people will often dance in the street until late at night. Holi (March 21) is a popular spring festival. Colored powders and dyes are thrown over people in the streets. Be sure to have an extra set of clothes if you are in India during Holi! Ganesh Festival (September 3) celebrates the birthday of the popular Elephant god. Thousands of clay statues get dipped in rivers or in the sea. Diwali (October 28) means ‘row of lamps’ and is called ‘The Festival of Lights’. During this 5 day Festival, people light fireworks and put oil lamps around their houses. People give each other sweets and gifts just like they do at Christmas in other countries. Diwali is also called ’The Indian New Year’. It celebrates the day when the god Krishna and his wife killed a terrible demon (Narakasura). About 12% of Indians are Muslim.Followers of Islam are called Muslims. Islam is the second largest religion in India. The word Islam means submission, or peace. This religion started in Saudi Arabia with the life of Mohammed, a religious and political figure from the 7th century. The Muslim holy book is called the Koran (Qur’an). Muslims believe that there is only one God, and his name is Allah. God had special messengers or prophets, such as Abraham, Moses and Jesus. The last and most important prophets for the Muslim is Mohammed. The five most important duties for the Muslim are called the five pillars. 2 Prayer. Muslims are expected to pray five times a day. Before that they have to wash their arms, feet and face several times, or wipe their face if no pure water is available. 3. Good deeds. This may be giving to the poor, providing education or helping to build mosques. The mosque is the Muslim house of worship. 4. Pilgrimage. A muslim is expected to make a special trip to Mekkah at least once in a lifetime. Mekkah is the holiest city for the Muslims, and it contains a holy shrine. 5. Fasting. For thirty days a year, the muslims fast during the daylight hours: from sunrise to sunset, they neither eat nor drink. This fast helps the Muslims to stay humble and grateful to Allah. Islam in India started as early as 800 AD. However, between the 12th and 17th centuries Islam started to grow with a number of Muslim invasions from Arabia and Iraq and Afganistan. The conquering Sultans (Muslim rulers) asked high taxes of Hindus, but greatly reduced these taxes for Muslims, and many Hindus converted to Islam. Also many fierce battled were fought between Muslims and Hindus and millions of people died. At the height of the Islamic influence, about 20% of Indians were Muslim. Today the Muslim population is around 12%. The two biggest groups within Islam are Sunni and Shia. Shortly after the death of Mohammed, his followers split because they did not agree on how the new leader should be chosen. One group said that the leader should be chosen by following the old Arab Sunna tradition. We call this group the Sunnis. The other group said that Mohammed's cousin Ali should be the next Muslim leader. This group is called Shia. The last 15 years have seen much tension and conflict between Sunni and Shia groups in Iraq and Syria. Islam has had a very big influence on India. Many Muslims are involved in trade and retail, and many trade routes with the Middle East and other Muslim countries have been opened over time. Some of the most famous buildings in India have been built by Islamic rulers. The best example is the Taj Mahal near Delhi. Muslims are still a very influential community in India, partly because Muslims mostly live in the big cities. India has had three Muslim Presidents. The president is the head of State; he or she is not linked to a political party. the most celebrated Muslim president was Abdul Kalam. India’s biggest film star is also a muslim; his name is Shahrukh Khan. There are around 25 million Christians in India today, less than 3% of its population. Most of them live in the North East, the Southern State of Kerala and the big cities like Delhi , Bangalore and Mumbai. You can find every kind of church from Catholic to Greek Orthodox to Protestant. The Anglican (Church of England) Churches in India changed their name to ‘Church of North India’ and Church of South India’ in 1970. Many people believe that one of Jesus Christ’s disciples, Thomas, came to South India in the year 52AD. The story goes that he started seven churches there, travelled across the country and was finally killed 30 years later. The Christian Holy Book is called the Bible. The first part of the Bible, the Old Testament, contains the story of the Jewish people through history. The second part, the New Testament is about Jesus of Nazareth and his followers. The most important Christian Festivals are Christmas and Easter. The first celebrates the birth of Jesus Christ, and the second his resurrection. Many churches and Christians have started schools, hospitals, and orphanages in India. The most famous Indian Christian did not even come from India. Her name was Agnes. As a girl, she grew up in a Catholic family in Albania. Her mother and father always gave to poor people. By the time she was twelve years old, Agnes decided that she wanted to spend her life helping the poor. She became a nun after school and at age 19 she started a job as a teacher in Calcutta, India. After teaching for years in school, she began to feed and help the poor, sick and hungry homeless people in Calcutta. She started a school for homeless children, even though she had little money herself. Soon many people heard of Agnes’ work. She received permission from the Pope to start her own order: ‘The Sisters of Charity’. With her friends, Agnes opened a home of the dying, a home for lepers, and homes for orphans. Their mission was to serve ‘The poorest of the poor’. We know Agnes today as Mother Teresa, the name that she chose when she became a nun. She was known as the ‘saint of the gutter’ and won the Noble Peace Price in 1979. She died in 1997 at age 87. There are many religions in India. Some you may never have heard of. Buddhism started in North East India through a man called Gautama. Gautama was born 2500 years ago as a wealthy prince in Nepal. His life was full of riches and pleasure. One day he walked out of the palace and saw sick and old people. He walked away from the palace, became a monk and started to think a lot about life and suffering. Most of the people who listened to Gautama were Hindus and believed in Reincarnation. They believed you visit earth many times, in different bodies. Gautama taught them that if they reached enlightenment, or ‘the light’, they would not come back to earth again in another body. They would go straight to heaven, or Nirvana. The road to the light for Buddhists is meditation. Today there are at least 350 million Buddhists in the world, but very few are left in India; less than 1% of the Indian population. 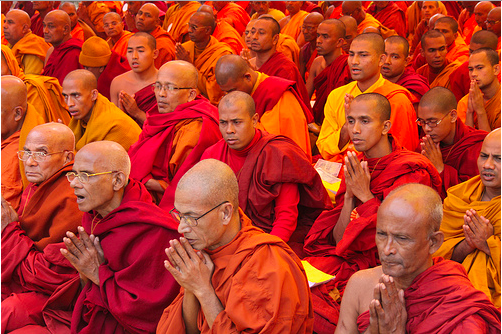 Thailand, Cambodia and Sri Lanka are some of the world's largest Buddhist countries. Sikhism was started in 1500 by Guru Nanak. The Sikhs believe that there is only one God, and that all people are equal before Him. There are 20 million Sikhs in the world, and most of them live in the Punjab State in North West India. About half a million Sikhs live in Britain. You can often recognize them by their turbans. Like Sikhism and Buddism, this religion also grew out of Hinduism. Jainism is at least 2700 years old. Like Hindus, Jains believe in Reincarnation. To a Jain, all of life is holy. Jains are against hurting plants and animals unless this is necessary. Jains drink no alcohol and are against all greed and selfishness.